Showing toy trains: why do we do it? I blame my father for starting it way back in 1951, when he visited Gamages of Holborn, now no more, but famous then for its toy department and model railway. His mission was to buy me, his train-fixated son, a train set for my third birthday. He chose a British made electrically powered set by Trix. My interest in Trix has somehow survived through all the other pre-occupations of childhood, growing up, adult life, and now retirement, though there were long periods when that interest was very much on the back burner. One stimulus has been meeting like-minded enthusiasts, above all Brian. In 1989 I was showing what with hindsight seems a rather pathetic Trix display at Brighton Modelworld, when he introduced himself as another local enthusiast, and put me on to the Trix Collectors’ Club. This started a close friendship that lasted the rest of Brian’s life. He had worked for what he called “the real railway”, about which he was also an enthusiast, and as an angina sufferer was sadly not a well man. My joining the Brighton based “Collectors” with their wide-ranging interest in old toy trains was another stimulus. The history of Trix has become a strong interest. It originated in Germany in the early ‘30s, and one of the main developers, Stefan Bing was a Jew; he it was that invented the “Trix Twin” system, so called because it allowed two trains under separate control to occupy the same track. Bing fled from Hitler to England where he started a “Trix Express” Company in Northampton under the aegis of W J Bassett-Lowke, the famous British model manufacturer and entrepreneur. After the war Trix trains began to be made again in Germany, and the British and German systems developed in parallel. Manufacture ceased in England in 1962. Why have I kept up this interest? Well, I find it a relaxing and absorbing hobby. Happy childhood memories and nostalgia are involved, a nostalgic experience I can share. At our shows people often tell me: ' I used to have some of those,” and I’ve met people who knew Northampton and could tell me stories about the original Trix factory. As a child I always dreamt of buying the most expensive loco in the Trix catalogue at the time. This was a “Flying Scotsman” priced at ten guineas, but with pocket money of 6d [2.5p] a week, that wasn’t possible. Although this model’s value today is at least 10 or 15 times the original price, I can now afford to realise my dream, so this also drives my enthusiasm. I have Brian to thank again, too. When he died suddenly in 2007 he left his entire collection to me, including rarities that had eluded me. I am so grateful to him. I increasingly enjoy the miniature engineering work of keeping very old models in good running order. (For me the aroma of hot oil and heated electrical motors, and the smell generated by the arcing of the electrical current across the carbon brushes have become unmistakeably evocative.) The train my father bought me is running still, and a second model costing my hard-saved three guineas (£3.15). The way the trains continue to fascinate children at the shows is a genuine delight. 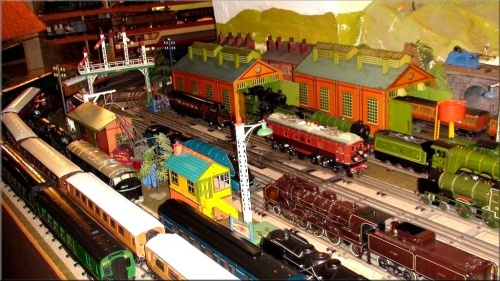 The Spring Toy and Model Train Show will be at the Knoyle Hall on Saturday February 17 (10 am – 4.30 pm). Admission: adults £4.00, children free. Come along for a great experience!